Christ established His church in 33 AD, but soon some were beginning to depart from the faith (forbidding marriage, etc. I Tim 4:1-3). The form of church government was gradually changing by some men who desired preeminence in governing the churches, so they began regarding themselves as successors to the apostle Peter. They called themselves “father” (papa, pope) — titles forbidden by Jesus (Mt 23:9). In 325 AD, Roman emperor Constantine recognized the Council of Nicea as the official law-making body for the church. He stopped persecution of Christians. Men voted for many changes in church organization, worship, name, etc. 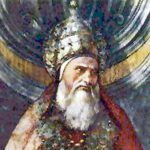 In 608 AD, Boniface proclaimed himself the “universal bishop,” the “papa” (Father) of the whole church. This set a precedent for all subsequent popes, an office unknown prior to that time, but predicted in 2 Thess 2:3-4. “Papal Infallibility” was proclaimed at the Vatican Council in 1870. Jesus termed these church laws as “doctrines and commandments of men,” laws which “make void the Word of God” (Mt 15:7-9), the Bible. Peter, one of the apostles, was told that what he preached had already been bound in heaven (Mt 16:13-20, IEB), and that the true church of Christ was built, not on him, but on the bedrock truth that Jesus Christ is the son of God. Scripture warns that the gospel truth cannot and must not be changed or added to (Gal 1:6-10; Jude 3; I Cor 4;6, Acts 20:29-31). The original churches of Christ were independent in each city (Rev 2,3) with no central earthly headquarters, each functioning under its own elders (also called bishops, overseers, shepherds). Paper Pulpit book, 407 pages for $10 donation (postpaid).